Planning and designing your homestead can be intimidating and overwhelming. Where do you start? It’s so easy to take on too much at once—or the opposite—to get swamped in the details and take no action at all. What you need is a way to break your homestead into manageable sections or zones. Permaculture zones are a way to do just that. What are permaculture zones? Zones are a central part of permaculture design. Permaculture is a design system focused on cultivating bountiful harvests by working with nature and maximizing efficiency. It’s the basic methodology behind Wild Homesteading. Check out these resources to learn more about permaculture. Permaculture: A Designers’ Manual – The original permaculture book by the founder of permaculture, Bill Mollison. Gaia’s Garden: A Guide to Home-Scale Permaculture – A fantastic book that serves as a great introduction to permaculture. Permies.com - Largest online permaculture community. Permaculture zones are used to break the land into 5 different categories based on how often you’ll need to be there. Crops, animals, structures, etc. are all placed within the zones according to how much time you’ll spend with these parts of your homestead on a daily basis. Breaking your homestead into zones in this way lets you quickly figure out where to set up your chickens, grow corn, or build the kitchen garden. To help you use permaculture zones to design your homestead, we’ve created a free and easy-to-print cheat-sheet that you can use to quickly design your homestead. This is a map of my homestead showing the designs of the permaculture zones on my homestead. The zone 4 band covers a seasonal stream and wetland that flows through my homestead. As you can see the zones can be mixed up a bit to fit the nature of each specific homestead. Permaculture zones are split into 5 different zones. Zone 1 is the area right outside your house while zone 5 is the wild lands that you don’t manage for production. The exact boundaries of the zones are fluid, but the basic idea is that zone 1 is the area you visit daily, with each higher zone being visited less and less. In addition, elements such as crops in zone 1 need regular maintenance while ideally elements in zone 5 may not need maintenance at all. When planning out your permaculture zones, make sure to keep in mind how much time you have available on a regular basis. If you’re short on time, then focusing more on the higher zones can help guide your design to fit the realities of your own situation. If you take the time now to design your homestead, you’ll save yourself time and frustration in the long run and be more likely to stick with homesteading. 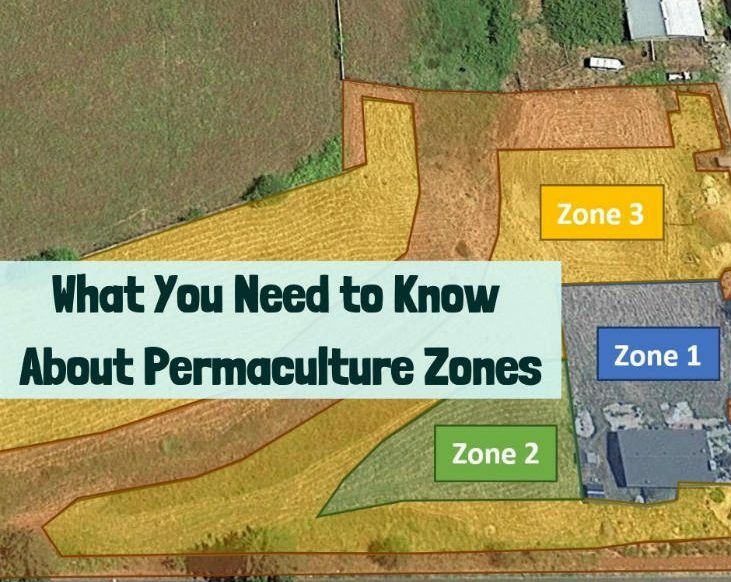 So, are you ready to get started with permaculture zones? Check out this intro video from Oregon State University and then let’s get started with zone 1. The kitchen garden will likely be a core part of your zone 1 design. But that does not mean that it can't be near zone 3 or even 4. This kitchen garden has a small zone 4 area alongside it which will help keep pests in balance. Permaculture zone 1 is the area right outside your front and backdoor that you visit every day. This might be the area you walk on your way to your mailbox or to your car. It could also be where your backyard lawn is. But it could also be the area where you take nightly walks alone or with your partner. The key is to identify the areas you visit regularly or could visit easily with little effort. You don’t want this area to be too big. You can only visit so much space every day. Eco-Lawn (an environmentally-friendly lawn for my kids that needs no fertilizer or watering). Kitchen garden (vegetables you use often in your cooking). Herb garden (herbs you use often in your cooking). Small number of fruit trees (dwarf or semi-dwarf trees). Small sheds with tools used on a regular basis. Flowers and other plants that we love to see each day. Native plants for wildlife (I include these in every zone). Your zone 1 may have different elements, but I hope you can see that all of these elements are ones that my family and I would interact with daily, or just about. This is where we’ll play, relax, and harvest food each day. The tools and equipment needed for these activities are also located within this permaculture zone 1. A mistake that people tend to make is to put the kitchen garden in the far corner of their backyard, and keep the tools in the garage or in a shed away from the garden. This means visiting your garden takes extra time. You have to go out of your way to visit your garden. The kitchen garden I’m building surrounds what will soon become our outdoor gathering area, and it’s just outside my back door. Just to the side of the garden is a kids’ play area, and the eco-lawn is adjacent to the play area and below the garden. The berries are adjacent to different sides of the garden, and the sheds are next to some of the berries. It’s natural for us to visit all these elements without even thinking about it. That means we’re more likely to harvest our vegetables, and more likely to notice problems. Designing with permaculture zones makes your life easier, not harder. Zone 2 is the area on your property that you still likely visit on a daily basis, but it’s a bit further out. You generally have to decide to go to these areas instead of just visiting them without thinking, like with zone 1. This can be a good area for more fruit trees, berries, and perennial vegetables. Chickens and rabbits can also be good additions to this permaculture zone. While you may visit these elements daily, you don’t need to be there all the time. So what elements does permaculture zone 2 generally have in it? Here is list of some elements to get you started. Small animals like chickens and rabbits. Vegetable gardens focused on crops you don’t harvest daily, like onions and many perennial vegetables. Fruit trees and berry bushes—a food forest is a great addition to zone 2 (like the one in the video). Compost bins and leaf mold piles. Sometimes I think of zone 2 as where your daily homesteading chores take place. These are the tasks that you set out to do each day before heading back to zone 1. Make sure you can access zone 2 easily. This means paying attention not just to distance but to ease of travel. For example, a steep slope may make an area that is close to the house zone 3 or even 4 instead of zone 2. If it’s hard for you to get there, you won’t spend much time there—at least not on a regular basis. This is the last regularly managed permaculture zone in this design system. Zone 3 is the area of your land that you only visit semi-regularly. You probably won’t be visiting this area each day. This is a good place for your staple crops like wheat, corn, and potatoes, as well as nut trees and fruits that can be picked in batches like pie cherries, apples, and pears. Animals that don’t need daily attention can also be kept in this zone. Here’s a list of possible elements for this permaculture zone. 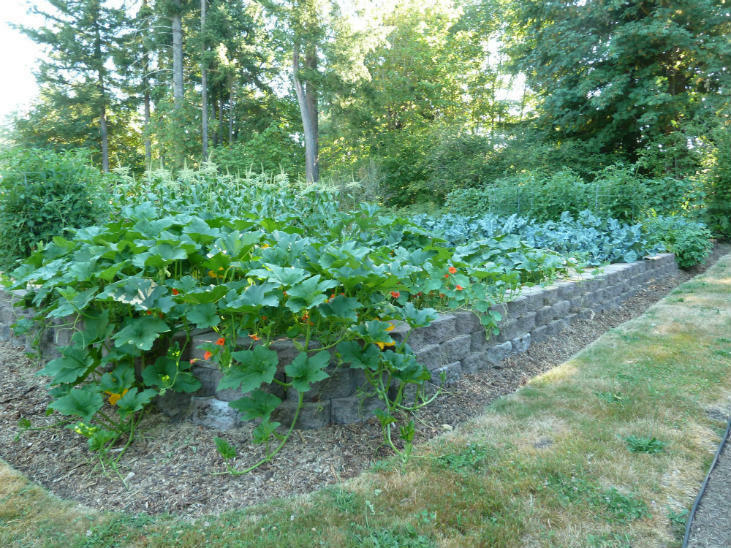 Food forest (mostly perennials—likely no regular garden vegetables, but perennial vegetables, berries, and fruit and nut trees are a good option). Large animals such as meat cattle. Staple crops such as wheat and corn. While managed, this area does not get daily human use and maintenance. Make sure you don’t put any elements in permaculture zone 3 that need your attention more than a few times a week. This zone 4 forest is alongside a zone 1 area. By having a semi-wild area near zone 1 it is easier to keep pests in balance by supporting local wildlife that eat common garden pests. This permaculture zone is mostly wild, though you may still manage it occasionally. Zone 4 is where you harvest wood from larger trees, (likely not coppiced,) and where you harvest wild food. Nature is likely doing a lot of the planting in this area through the actions of birds and seeds blowing in the wind. But you can still select which plants you want to let grow. There is less going on in this permaculture zone in terms of homesteading projects, but a lot more in terms of wild activity. Here are some of the elements or activities that fit this permaculture zone. Wild plant and mushroom harvesting. Zone 4 will likely feel fairly wild, but you’ll be visiting it often enough to have a regular impact. Even still, this zone provides a critical area for wildlife to live, which will benefit the rest of your homestead. Wilderness areas like this are a great place to observe and learn from nature. But you don't need a large beaver pond to have a zone 5 area even a strip of native trees and shrubs along the edge of your homestead can be considered zone 5. Here is the area that is supposed to be completely wild and unmanaged by human activity. This is actually one area where I don’t fully agree with the classic permaculture zone breakdown. The vast majority of us won’t be lucky enough to have land with a truly wild area that was not negatively impacted by humans in the recent past. If you just walk away from this zone, you may be ignoring negative impacts from past human activities. By taking some small actions, you may be able to help nature transform a wild-looking degraded area into a fully functional and diverse wild area that supports more wildlife than it would have otherwise. Perhaps in this case, the best practice is to initially consider an area to be zone 4 and then transition it to zone 5 as you step back your interventions. That said, permaculture zone 5 is also supposed to be an area for observation and learning. Watching how nature improves degraded wild land may teach you important lessons for the other zones. Which approach you take is mostly based on your own values, but here are some elements/activities that fit zone 5. Small scale repair of past damage. Very limited harvests (i.e. the occasional snack on berries, and potentially taking plant cuttings for propagation). But at its core, permaculture zone 5 is the space you go to observe and learn from the natural world. Not every homestead will have a zone 5. On my own, for example, I’m limited at this time to zone 4 (though one day part of my zone 4 may transition to zone 5). Now that you know the basics of each zone, you’re probably wondering how to get started. Here are some basic steps you can follow to help you with this. Draw in any existing structures and large features such as trees (or forests), shrubs, and bodies of water. Consider what kind of elements or activities you’d like to have on your homestead. For each activity, think through how regularly you’d need to be visiting that area and label it with the appropriate zone. Consider how much time you have to manage it all. Look at your list. Does it seem like it fits with your life? Make adjustments as needed and be sure to keep that question in the back of your mind. Zone 5 is a place you would generally not interact with too much other than to observe (Depending on the size of your property, you may not have all 5 zones. That’s fine. The point is to use the zones to design your homestead, not the other way around). Look at your map. Does everything fit into the zones you drew? If not, you have two options—remove some of the elements or expand the zones. Now take another look at your map. Do you have enough time to manage it all? Consider what kinds of tasks you would need to do daily and what zone each activity is in. Writing it down on paper is the best way to flesh out your thoughts and see how it all adds up. Now write what you need to do every few days or every week, and in which zone. Now do the same for monthly activities, and finally, for yearly activities. Almost done! Take a final look at your map and at your lists of activities. Is it manageable? If not, shrink or remove some of the activities. (If you find yourself cutting back more than you want on something high-maintenance like the kitchen garden, is there anything in zones 3 or 4 you could expand? Maybe you’ll have less traditional vegetables but more perennial vegetables, nuts, berries, fruit trees, and mushrooms.) You can go back and make revisions as many times as you need to make sure your design fits your life, your priorities, and your wild homestead. Again, don’t worry about having all 5 zones if your homestead is on the small side. An urban homestead might only have zone 1 and 2. Even up to a few acres, you may only have room for zones 1, 2, 3, and perhaps a little 4. This is okay, and it’s just the reality many of us find ourselves in. But this is also why I include native plants and structures for wildlife in all my zones. Essentially, I’m adding small parts of permaculture zones 4 and 5 to the first 3 zones. It’s also okay for your zones to change over time. When your design is complete and you start implementing it, you will likely want to make some changes. Your permaculture zone map should be a living document that changes with your own life and with the on-the-ground realities you discover along the way. No one can make a perfect design that will never change. The key is just to start—to get a design on paper and then to start implementing it. So, are you ready to get started? Before you go, make sure you grab your free, easy-to-print cheat-sheet that can be your guide as you design your permaculture zones.